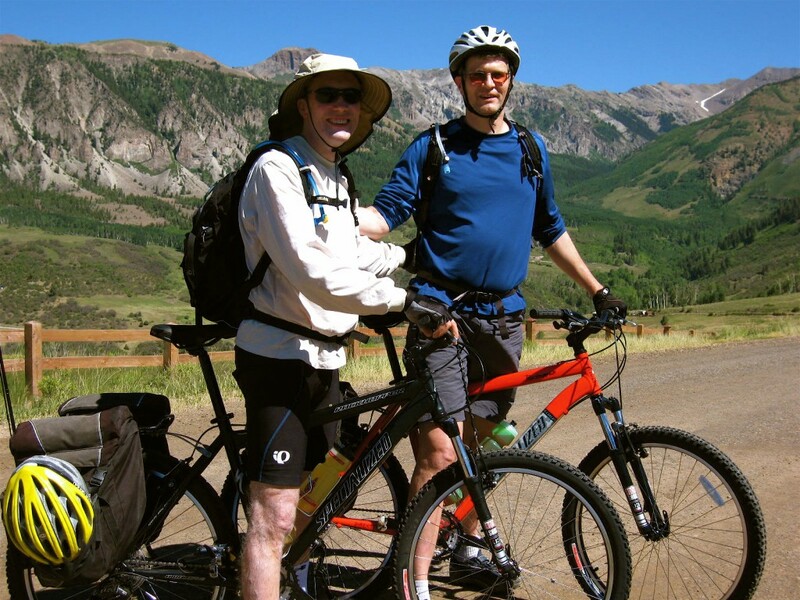 In late May 2006, a group of us rode our mountain bikes 225 miles from Telluride, Colorado to Moab, Utah. 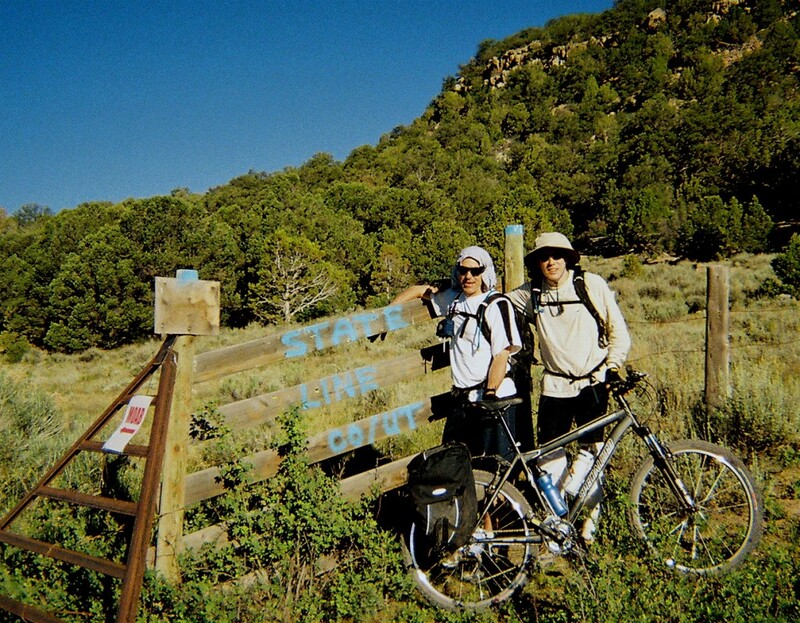 We contracted with the San Juan Hut System’s Mountain Bike Tour, which has become very popular over the years. They were incredible and provided the route and hut system, which was stocked with food and sleeping, bags at about 6 separate huts along the biking route. The route took a total of 7 days. Our group of riders complemented the scenic diversity and unique nature of the week: Alan Hoff, a premier lawyer from Baltimore; Stan Miller, a high-end doctor from Baltimore and Bob Travers from Baltimore, a money manager. Stan and I arrived in Montrose from Baltimore to avoid the potential difficult flight and traveled to Uray to visit the quaint little town. We had a grand time hiking around “little Switzerland” before heading out to meet Alan in Telluride the next day- his flight made Alan sick it was bumpy. We picked up our bikes and gear in the Telluride Bike shop and checked everything out before heading out early the next morning. 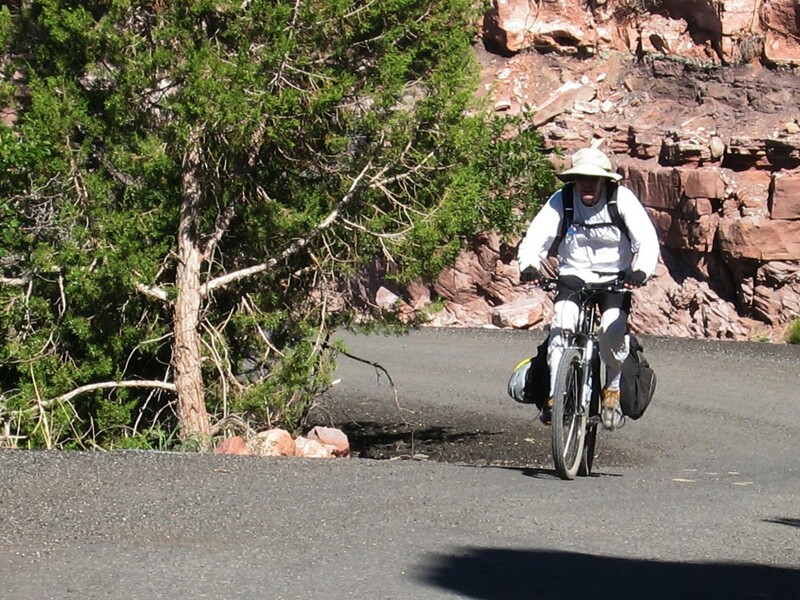 Our Panniers were heavy and at this altitude we felt it. Day 1 We cruised through town and began climbing on Last Dollar Road and it was difficult with the additional weight. Our conversation flowed around the beautiful scenery as Last Dollar Pass was just so steep and being the first day it crushed me. Last Dollar Road ascends 2,800 vertical feet to the first hut over a meager 15 miles, skirting around million-dollar homes and proffering views of the Lizard Head Wilderness, San Miguel Mountains and a smattering peaks towering over 13,000 feet. For the meantime, ogling the vistas kept our minds off the riding. It was nice pulling into the hut and fixing some decent grub. Now that night I walked on the mountain to try to acclimatize before Stan and I slept outside for a while watching the bright stars shine above. Radiant moon beams painted the forest in silver hues and we listened to the forest whispers before retiring inside the safety of the hut. Next Morning Alan and I went for a mountain climb and they we headed out for the next hut about 20 some miles away. We left Last Dollar Hut after a hardy breakfast, riding a steep downhill track into and through a pine-shrouded forest, and leveled out at about 9,000 feet before landing at Spring Creek. 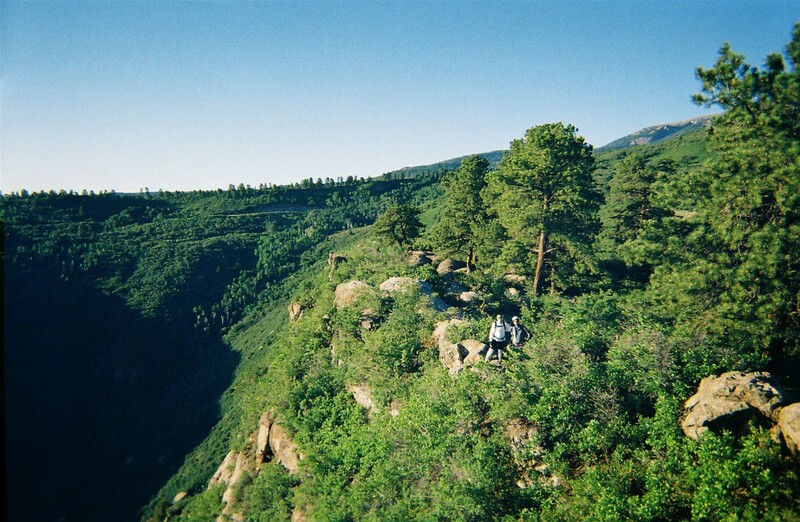 We would be at about 9,000 feet for the duration while on the Uncompadre plateau. The deeper we got into the Uncompadre Plateau the more the wilderness surrounded us. Towering ponderosa pine, quaking aspen, blue spruce, juniper and sagebrush painted the landscape, It was an incredible collection of vistas strung together and truly awe-inspiring. However I remeber one line in the San Juan hut Manual that stuck in my head, “The route is remote… riders must possess survival skills.” What might I have to survive? Bears. Dehydration. Altitude. Weather. Hut mates. Well this is where it came into play. This is where I crashed and bailed out at a 5 star resort for a night from severe muscle cramping- nothing like I had ever experienced. After the second night out at Spring Creek, I cramped so bad and the next day I was no better, that I bailed out on my friends to seek medical attention. I was dizzy, light headed and was not feeling well to say the least. I found a US Park ranger and he directed me to a smoking cool 5 star-converted ranch. I got a room with a soaking tub, and double bed with a good book. For dinner I dined in elegance. My waiter was European with elegant manners, and the table set with fine crystal and bone China. I ordered Shrimp cocktail, New Zealand Lamb, a glass of red wine and fresh asparagus. I finished with an after dinner drink before retiring to my room. I took a long hot bath and the next morning a police officer drove me to my traveling companions at Columbine Hut. At the hut, the police officer told me about another 5 star resort at Gateway and so the discussion started with my friends about the new place and was it fair to bail from the hut system for the 5 stars – I love 5 stars. We had a night at the Graham ranch, which I have little memory of but it was fun but the argument continued. Now onward we traveled the next morning and were arguing about the 5 stars when we pulled into Gateway. 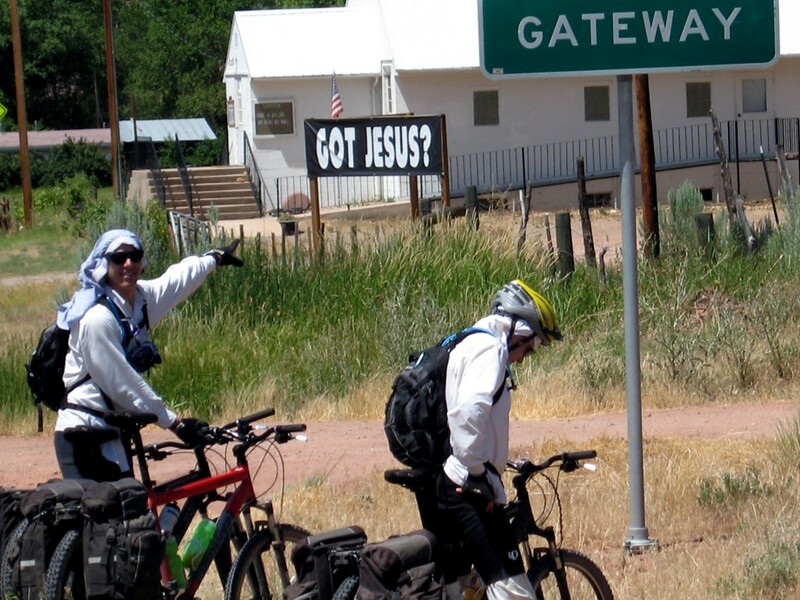 Alan and Stan thought it was a joke because there was nothing in Gateway proper other than Jesus and a run down gas station and an abandoned Uranium mine. 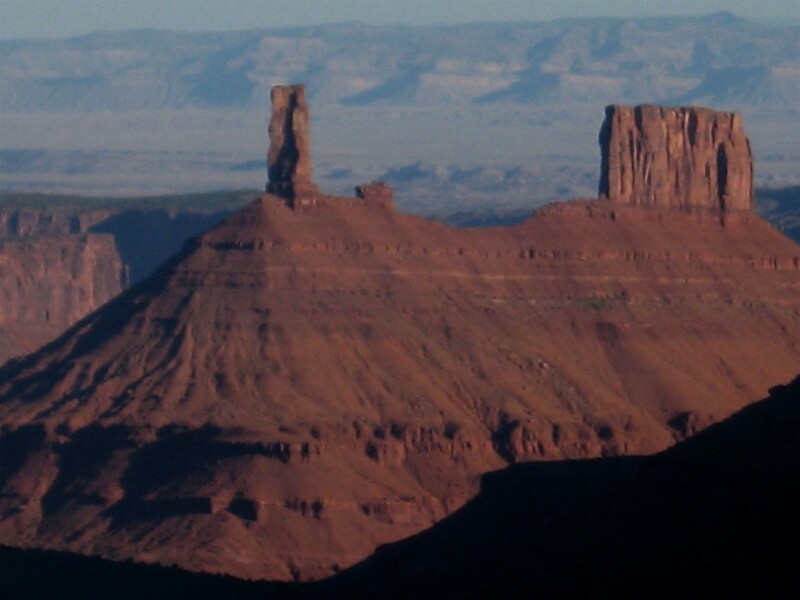 I told them to have faith, ( they found Jesus) and about another 3 miles down the road (parched and tired) we rounded a bend at the intersection of the Dolores river and found the resort as well as three beautiful women. They were in front of the truly beautiful structure and they beckoned us to come on up. Offering cold beer and a 5 star resort with good food “of course we bailed” There ended the discussion and we got a smoking cool huge room with a sitting parlor, private large shower and air-conditioned. I briefly went out for a ride at dusk to view the spectacular red hued colored mesas and canyons – This is God’s country. I headed back to the room and where we shared too many beers with the fine young ladies before asking them to join us for dinner. We all dined in elegance. Started with champagne or wine or fine beers, followed by hors dourves and then we dined on the finest prepared scrumptious tenderloin, or wild caught fresh salmon with the accompaniment of fresh garden vegetables. The beautiful young ladies made for great conversation and they offered to bring us Gatorade in the morning as we peaked the summit at about noon on the way to the La Salle Hut. So it was a fine evening and then at 5 Am we left the soft beds for the tremendous climb. My friends somewhat doubted the young ladies commitment to bring us Gatorade but at noon the car came up the road and we all shared a fine lunch. Thank you young ladies. 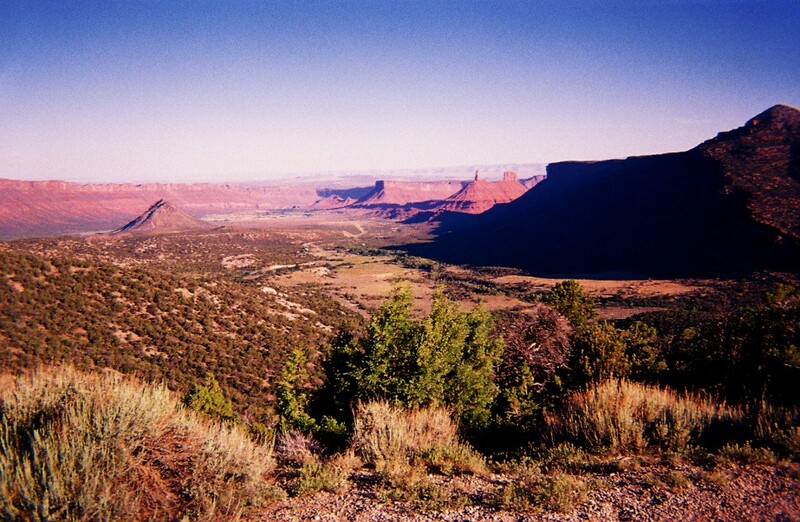 After a spectacular climb through a green-walled maze, we reached a stunning view of the Colorado Plateau, the La Sal Mountains in the distance and the remote Henry Mountains where the skyline began to fade and we crossed over form Colorado to Utah. Below us looking backwards, the Dolores and San Miguel rivers wove a series of carving and twisting canyons. Above them, desert mesas leveled and stretched into the distance, where we caught our first glimpse of the La Sals and the hazy outline of the far-distant Henry Mountains. Wow the ridgelines and cliff faces on the ridgeline was really cool to dance around and hop across. We finished the day lounging in a small grassy meadow in front of the La Sal Hut, reminiscing over the previous six days’ whirlwind of events. I woke Stat and Alan up at three in the morning drinking beer because I could not sleep. The next morning we had a rather long decent into Hades the desert floor. 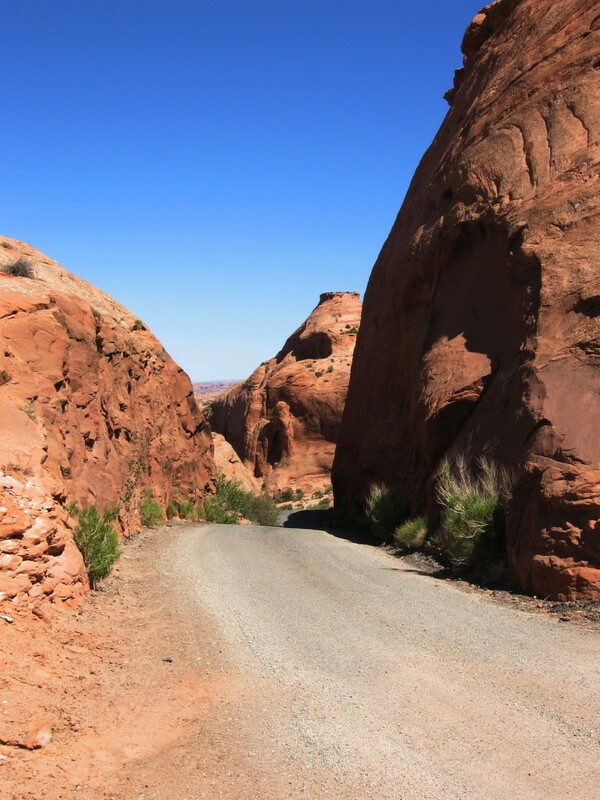 We lost a lot of elevation and Bounced down Sand Flats Road. 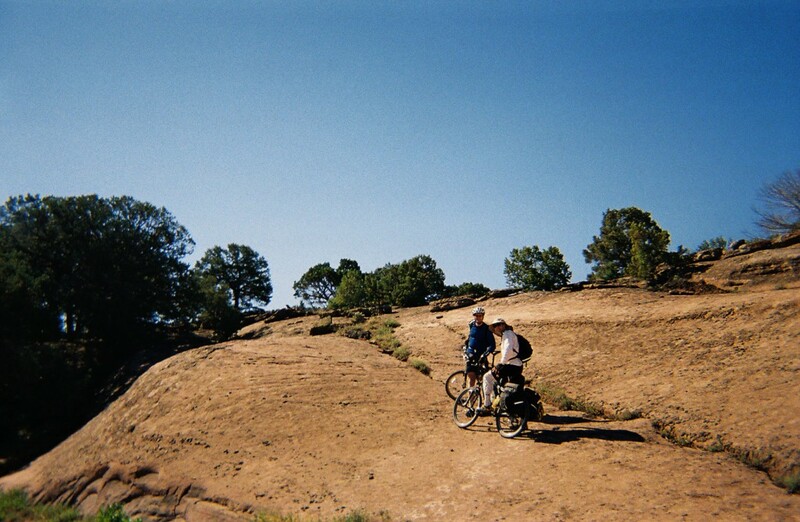 We rode on petrified sand stone dunes and it was rather hot and thank God we cam into Moab at noon as it was blistering. The realization that I had just ridden 225 miles, climbed almost 17,000 feet, and was only now finishing off the last of the 21,000 feet of downhill, made my head spin. Or maybe it was the heat. 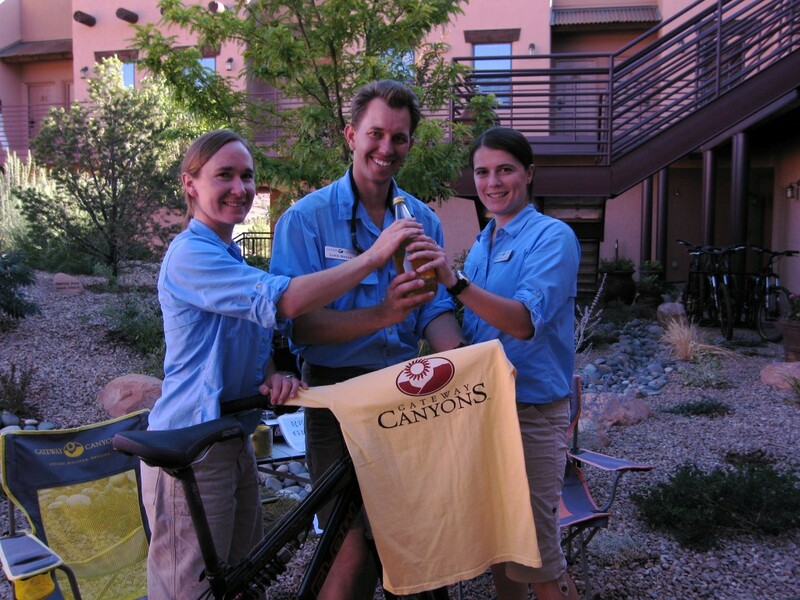 We checked the bikes in at the check in spot and drove to I think Grand Junction and the next day blew out to our jobs. Here are a few tips about what to expect and how to prepare for seven days on a bike and six nights in a hut. We used San Juan hut Systems and you can visit them on their web site at www.sanjuanhuts.com, or call them at (970) 626-3033 for more information. 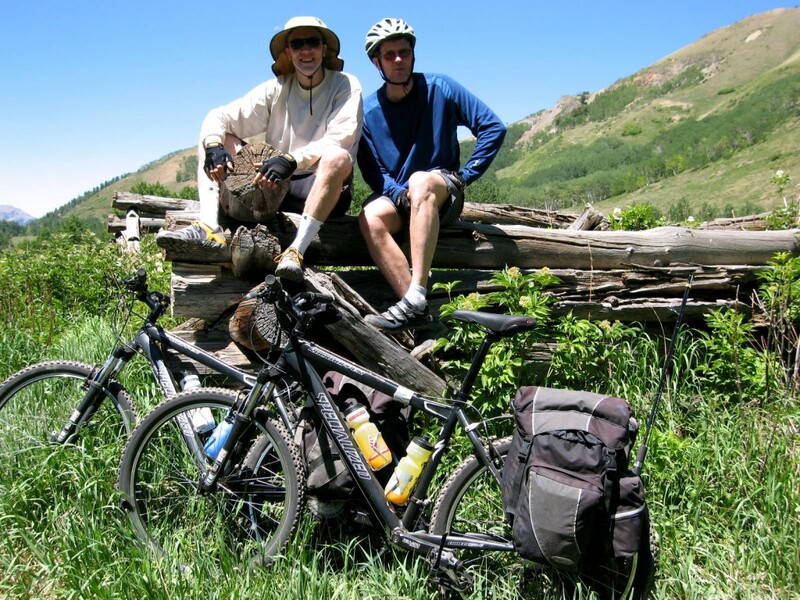 Day 2 – 20 miles, 1600 ft gain, Hut= Spring Creek. Day 3 – 32 miles, 1800 ft gain, Columbine Campground, Me = 5 Star Resort. 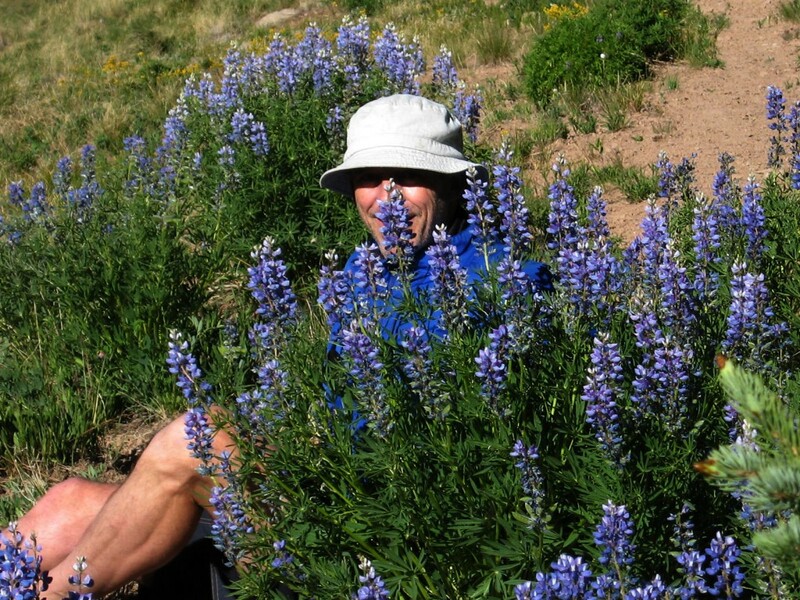 Day 4 – 33 miles, 1600 gain, Graham Ranch Hut.